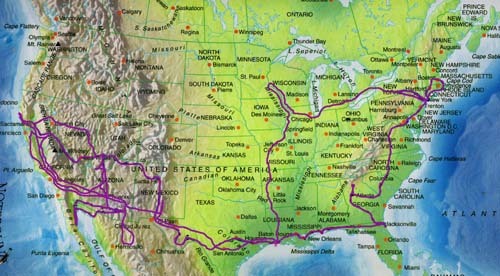 Lorraine Chittock, DOG and Bruiser's route across America. 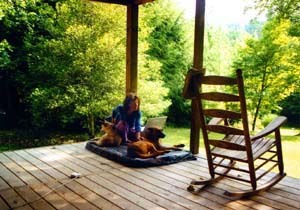 Lorraine Chittock writing on the porch of a 200 acre estate in the Appalachian Mountains. Thank you Steve Pigott! 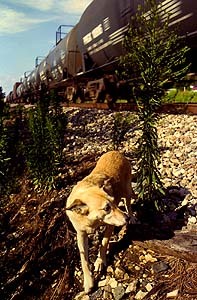 DOG, a little too close for comfort next to the Mississippi River in Wisconsin. 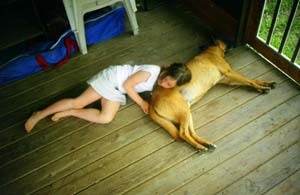 Charlotte and Bruiser in Houston, Texas. 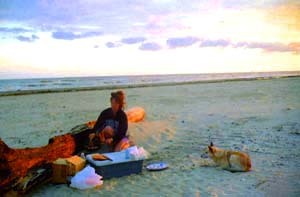 Camping at Holly Beach, Louisiana before the attack of the Giant Mosquitos. 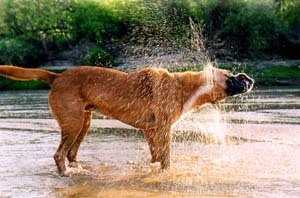 Bruiser shaking off some of the Santa Maria River in the Arrastra Mountain Wilderness, Arizona. Lorraine & DOG writing in Jacksonville, Florida overlooking a marsh where the next day, manatees mated. DOG relaxing in a luxury house in Jacksonville, Florida, a two week gift from Lisa Johnson. Thank you! 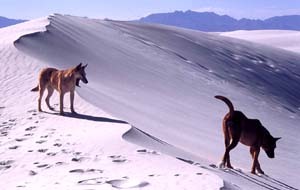 DOG & Bruiser playing at White Sands, New Mexico. Lions licking their lips, monkey's crying from trees in deep rich forests, and standing naked in a desert sunset while pastels wash white sand myriad shades of magenta and ochre... Lorraine Chittock wanted all this and more. By the age of six, Lorraine had traveled twelve times across the Atlantic Ocean with her British parents. This was the foundation for her nomadic life. But as a teenager, Lorraine saw a dilemma. "How do you travel while tied down making a living, with limited vacations?" Chittock stayed relatively stationary during her school years, but at 18, flouted convention by buying a motorcycle to travel solo around California. Women didn't ride in 1978. A year later she was trekking across Europe. At 23, after completing a two year degree in photography, the road beckoned once again, this time to photograph people in their natural element in Africa. She returned after three months to complete a BA degree in Liberal Studies at the University of the Pacific in Stockton, California. She paid her way though college by waitressing and bartending in seedy diners, chain restaurants and five star hotels. But despite all the vodka-tonics and steaks served medium rare, she used the daylight hours to explore subjects as diverse as carnival workers, the homeless and floral still-lifes. In 1991, after a year of mentoring from a Pulitzer Prize winning photographer, she was hired as a photo editor and photographer for Egypt Today, an American owned magazine in Cairo, Egypt. Over the next two years she traveled on assignment to the Sudan, Morocco, Pakistan, Jordan and extensively around Egypt, photographing ex-presidents, open heart surgery, haute couture fashion and top Egyptian film directors and actors. Chittock left the magazine to teach photography to expatriates, while also exhibiting in galleries and taking on advertising assignments. In 1994 she launched her publishing career, producing greeting cards depicting whimsical scenes of camels munching on Christmas trees and Santa riding a camel - always with the magestic pyramids as a backdrop. The following year she returned to the Sudan. With an American woman, she accompanied 200 camels and eight Sudanese men across the Libyan Desert on the Forty Days Road, an ancient caravan route. The trek resulted in the coffee-table book, Shadows in the Sand - Following the Forty Days Road, which was an immediate hit amongst the expatriate population. In 1998 Lorraine married and moved to Kenya. Living in a suburb of Nairobi merely a mile from where Out of Africa was filmed, Chittock unfortunately suffered the same isolation that Isak Dinesen endured 85 years earlier. She began writing fiction as an escape, and explored her nature-rich surroundings with two neighborhood dogs, Dog and Bruiser. These daily walks gave Chittock a renewed sense of both herself, her work and her body image. Lorraine and her husband eventually left colonial suburbia where utilities rarely worked, and moved to the edge of a game park. Instead of infrastructure being the cause of poor telephone service, giraffes were the ones inadvertently pulling down the lines. But these difficulties were dwarfed by the ongoing life and death dramas at their doorstep. In the bush, nature rules, and Lorraine's walks were fraught with danger, including heart-stopping encounters with spitting cobras, warthogs and big cats. 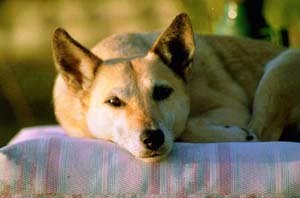 These events, and her travels with Dog and Bruiser amongst nomadic tribes, resulted in the first draft of On a Mission From Dog - A Woman's Walking Adventures in Africa. 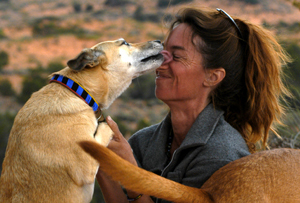 In 2003, after twelve years of living overseas, Lorraine returned to America with her canine companions, and has spent the last two years journeying around the U.S. She's discovered there's a reason why so many retirees take to the open road in RVs. "Nomadism," says Lorraine, "isn't an escape from society, but a return to natural rhythms deeply embedded in us." While on the road, Lorraine was accepted into the Society of American Travel Writers, World Picture News and Arabian Eye stock agencies, and acquired regular columns in various animal magazines. 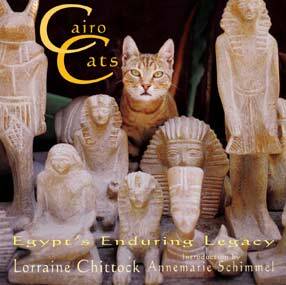 Lorraine plans to finish On a Mission from Dog while publicizing the newly released Cairo Cats - Egypt's Enduring Legacy. When living in Cairo and during subsequent trips, Chittock became an urban wild-life tracker, photographing the felines roaming the streets as they have for thousands of years. The subsequent picture book juxtaposes Chittock's intimate images with words from Arabian and Ancient Egyptian literature and folklore. Her aim is to connect Westerners with a much-misunderstood part of the world with an animal many can relate. Lorraine's teenage dreams came true. 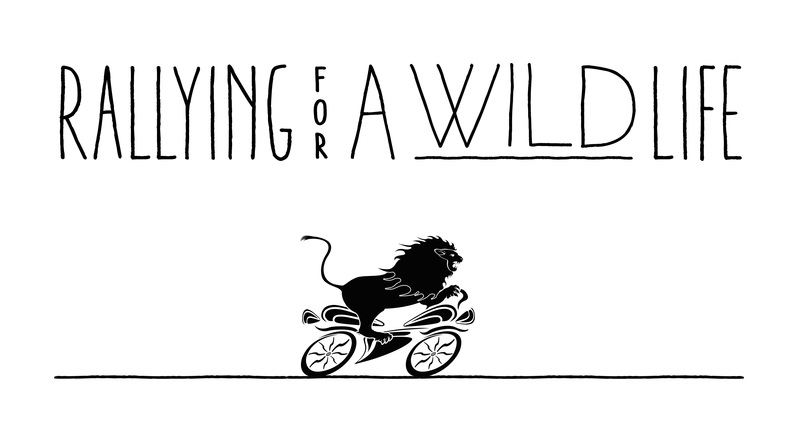 Her livelihood doesn't depend on working in one location, and she travels at her own pace. Some people travel to find themselves. Others to escape. For Lorraine, it is the rhythm of life itself.